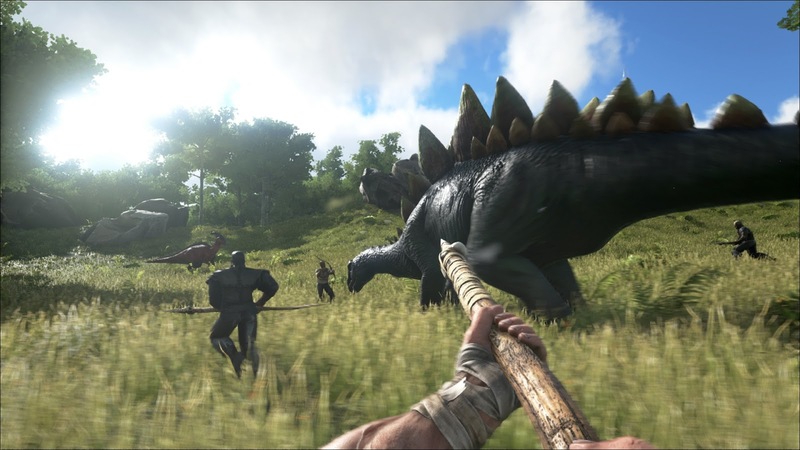 Ark: Survival Evolved has to be one of the more interesting ‘Early Access’ titles so far. Having ‘launched’ on the PC back in the summer of 2015, it is very much a well-progressed game, having seen content expansions on its native platform, and now what amounts to comprehensive beta releases on PlayStation 4 and Xbox One. So it’s still unfinished game, but offers more than enough exploration and dinosaurs to keep you going for weeks on end right now. By now, most of us are quite used to survival games starting us out in worlds where we’ve got virtually nothing, and no idea what we need to do next, other than the knowledge that if we don’t get to work soon we’re going to be food. Minecraft, Don’t Starve, Dragon Quest Builders, and many other survival games take this approach and make the experience very much about writing your own story through your actions. As our avatars wake up on the beach, in the desert, in the forest, we ask ourselves “what do we do now?” In that there is freedom, exploration, and experimentation, which is the real appeal of games like Ark. 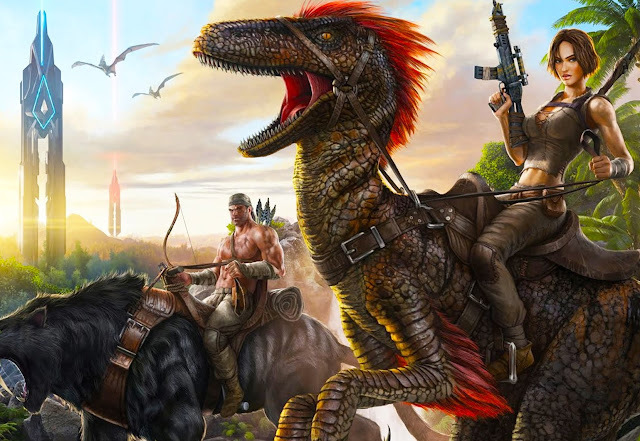 Ark is very much a survival experience and in order to get anywhere you are going to need to learn how to survive, and learn how to survive fast. What it does a little differently (and quite appealingly) is offer players a levelling system. Levelling can be used in order to learn crafting recipes to build items such as tools, clothing, buildings structures and storage containers. While levelling up can allow learning new crafting recipes, figuring out where the materials come from in order to do the crafting is a whole other story. Chopping down trees, picking at giant rocks, gathering berries and fibres from plants or hunting dinosaurs big and small are all essential if you hope to have the kind of resources that you’ll need to build the essentials to survive. While this sounds easy as a concept putting it into practice is a whole other story, as different objects can yield different resources. Gathering wood requires a hatchet to chop down a tree but using a pickax on that same tree will yield thatch, which you will also be needing. Not only do you need to be careful to make sure you’re making balanced use of the resources around you, but you’ll also need to experiment just to figure out how to get some of the materials that you need. Freedom to play however you’d like is also encouraged by the game giving players experience for every action that they take. This means that there’s no one way to level up which gives a bit of leeway to players who would rather concentrate on specific aspects. Ark can be played alone but the amount of time that it will take in order to do anything is ridiculous making it much more enjoyable to play with others and to divide up tasks. Before actually getting started on those tasks however it is recommended to start a tribe as members of the tribe will receive experience from what other members are up to. This also means that not everyone has to learn the same crafting recipes allowing for the diversity to come sooner, rather than later. Now all of these small tasks can sound tedious when all you really want to do is dive into this world and ride a dinosaur. Unfortunately all of these smaller tasks will be required as riding the various dinosaurs require various saddles which in turn come from levelling up and performing other tasks. There’s a real grind involved before you’ll be able to craft tranquilizer darts in order to put the dinosaurs to sleep in order to tame and then be able to saddle them. Once you’re done that you will also want to build a fence to keep them in while you’re off doing other things, which also requires a fair amount of work. Nothing worth having comes easy! If there’s anything the developers might want to look at between now and the game’s full release it’s this grind – I can easily see it putting some players off the game. 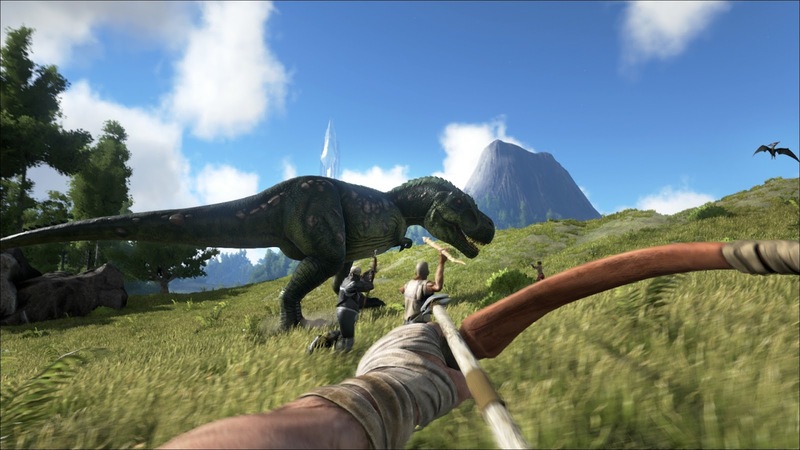 While Ark has come a long way it still has some little ways to go when it comes to performance. While players of the PlayStation 4 version don’t need to mess around in the settings like their PC-playing buddies to, there can be stuttering frame rates, or things simply not rendering properly. Skipping framerates generally occurred when jumping in and out of the water, and it did lead to my character perishing at times, which is obviously not acceptable. Additionally, for a game so focused on multiplayer, the servers are remarkably flaky, and private matches simply don’t work at times. Also of note is that if you’d like to run a dedicated server for the game, you’ll need two PS4s currently. One acts as the server, allowing people to join the game, and the other one so you can actually play with your friends. There’s a patch coming in later that will allow PCs to act as servers for the PS4 games, but for now it’s an incredibly clunky and limited system. Ark still hasn’t launched yet, so it’s worth keeping that in mind. It’s certainly on the right track, and combines some quality mechanics and setting with a real multiplayer focus that should see people coming together to create little villages to exist in. Hopefully there’s still enough time to smooth over the game’s remaining issues.